Anakin, being a Grade A doofus, decides that he must save Palpatine from the clutches of the vile Jedi MACE WINDU! So, he chops off Windu's hand and has Palpatine blast him to death with some more of that sweet, sweet Force lightning. He does this for two reasons: 1) He wishes to have Palpatine stand trial and 2) He wants to learn the secrets of keeping people alive so that Padme won't die. However, reason number one goes out the window (along with Mace Windu) as soon as he chops of Mace's hand. In the course of two minutes, Anakin has gone from the Jedi who wants to turn in Palpatine and bring him to trial, to the Jedi who is surrendering to Palpatine, becoming his apprentice and slaughtering a room full of children. I feel sorry for anyone who chose that two-minute stretch to use the rest room. After Anakin kneels and agrees to do anything Palpatine asks, Palpatine says, "Henceforth, you shall be known as Darth... Vader." It's unusual that we are privy to what appears to be an ancient Sith naming ritual but what's more amazing is that he gets the name on the first shot, with only a moment's hesitation! I would have liked to see a more realistic scene, where Palpatine starts throwing some names out there. "Darth... Predator? Darth... Sipid? Darth... Correct?" This scene could have benefited immensely from the direction of Sam Raimi. It makes sense that the Sith all have such stupid names, since naming them seems to be the same process people use to name a rock band. It is unfortunate that Luke did not kill Vader and join the Emperor in Return of the Jedi because he blew his best chance at becoming Darth Zeppelin. I have a lot of problems with Commander Cody. I'll try to tackle these one by one. First off, why is he the only clone with a name? This just raises too many questions. Presumably there are more names for other clones, but his is the only name spoken in the film (as far as I can tell). Why do the clones have names at all? Wouldn't an ID number system be simpler? After all, they're just clones. Who names these clones anyway? Do they come with little birth certificate things like Cabbage Patch Kids used to? Secondly, Cody. Cody. What the hell kind of name is Cody to be in the Star Wars universe? Why not call him Commander Todd or Commander Travis? Thirdly, Commando Cody was the hero in three science fiction serials made around 1950 by Republic Pictures, and in a 1952 feature movie based on the series titled The Lost Planet Airmen. He is often referred to, incorrectly, as Commander Cody. In Lucas's obsession to return to the glory days of the 50's serial: He has done more than simply emulate the style, he has stolen the character names. Just to note: what do you think George Lucas would do if someone made a movie with a character named Darth Vader? I have one guess, and it rhymes with "paw toot." Fourthly, Commander Cody is the stage name of George Frayne in the American rock and roll band Commander Cody and His Lost Planet Airmen, which took its name from the 1952 movie that Lucas loved so much. So the real question is this: is Lucas stealing the name of Commander Cody or is he stealing the idea of stealing the name of Commander Cody? On the surface, Order 66 appears to be an order where the clones are to shoot Obi-Wan Kenobi in the back for no apparent reason, but it turns out to be so much more: Order 66 is apparently the super secret code for the order to kill all the Jedi. This plan had been on the table for well over a decade, if it was part of the Clone army's initial plans. One would think that a code so obviously sinister would be better encrypted than simply being named "Order 66." This is especially true considering every single soldier in the entire army seems to have a total understanding of Order 66. No one raises any questions; they just dutifully slaughter the Jedi one after the other. "Oh, Order 66 already? So this is where we kill all the Jedi, is it? Right ho." The first six hours of the prequel trilogy makes one thing perfectly clear: the Jedi can deflect an infinite amount of blaster fire with their lightsabers without taking so much as a single hit. It's interesting that the Jedi have the ability to flip and spin around, deflecting blaster fire from 360 degrees while destroying battle droids. However, it seems to take no more than four clone troopers shooting at them from the same direction to kill a Jedi It also doesn't help that the Jedi's ability to read emotions or sense any form of danger seems to not exist in the prequels. It must be the "shroud of the dark side," right? After Order 66 is issued to the clone troopers on Kashyyyk, they attempt to shoot Yoda in the back. Yoda, of course, is wise to this and in a violent fit of rage, ignites his lightsaber to decapitate both clones. After that, the two Wookiees (Chewbacca and Tarfful) do not question Yoda. They are not upset by what just happened. They simply accept what Yoda has done and scamper off with him. After all, good relations with Yoda do they have. As they walk off, Yoda climbs up Chewbacca and sits on his shoulders like some sort of toddler. I'm not quite sure to whom this is more demeaning, Yoda or Chewbacca. The way Obi-Wan describes Vader's treachery to Luke makes it sound like it was quite a task indeed. What Obi-Wan does not explain is that there was very little hunting involved. What Vader actually did was show up and kill everyone. "It was quite easy, really," Obi-Wan might have explained. "It only really took Vader about twenty minutes. But what a hunt it was!" Why all of a sudden are the Jedi children called "younglings?" Replacing the word "younglings" with the word "padawans" or, even more simply, "children," would have made this ten-minute segment of the movie infinitely more tolerable. Instead, we get about five youngling bombs dropped on us by Yoda, Obi-Wan and Padme, rapid-fire. Calling them younglings conjures up images of baby trees. It also makes everyone seem like an old geezer. Why not just call them "small fries" or "whippersnappers?" "Oh Anakin. Obi-Wan told me terrible things. He said you killed sprouts!" "Padme! It's all lies. Obi-Wan lies! I would never kill ankle-biters! It's not the Jedi way!" I'm sorry. I know it's shallow. It's probably my fault, but I just cannot get over Jimmy Smits. I don't know what it is. I don't think it's anything that he's doing in particular, but every time I see him I find it so distracting. No matter how much time passes, every time I see him I think, "Sweet Lord! What is Jimmy Smits doing here?" It doesn't help that he's such a giant monster of a man. Aside from clearly packing on some extra weight for the winter, he seems to be about a foot taller than Chewbacca. Who is this gigantic behemoth of a man? What planet did he come from? 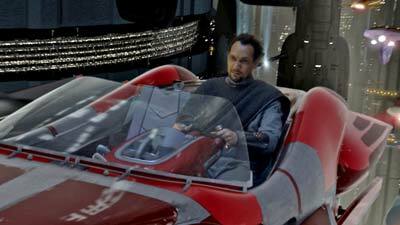 And I'm not talking about Bail Organa, I'm talking about Jimmy Smits. To say that Chewbacca has a useless part in Revenge of the Sith would be putting it lightly. Aside from having Yoda crawl all over him like he was some sort of jungle gym, he seems to serve absolutely no purpose in the administrative or military actions on Kashyyyk. Presumably, the only purpose he serves is to give fanboys tingles up their spines. And in case you are an alien, from another planet, that was born yesterday, and is really, really, tremendously out of touch with the world around you, Yoda conveniently says, "Goodbye... Chew... bacc... a." This is followed with a six-minute still of Chewbacca's big Wookiee head as he howls for the camera.